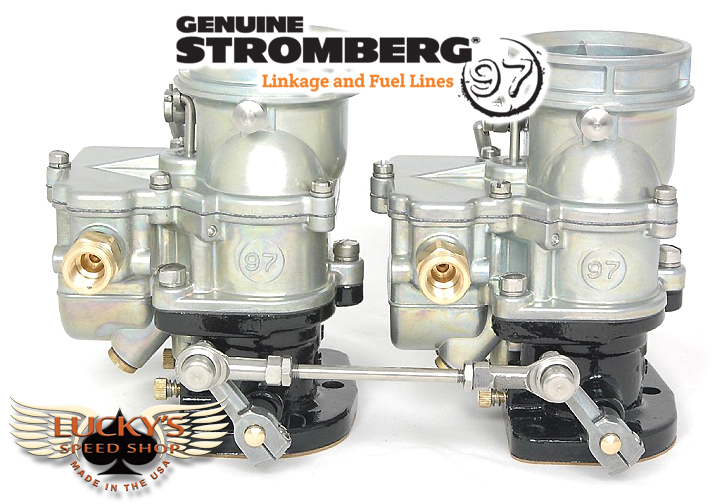 A Premium 2×2 carburetor linkage with rod ends for positive action. This linkage is sized for use with intake manifolds and manifold adapters that space the carburetors 5 to 5-3/16in apart, including most ‘2×2 into 4-bbl’ adapters, and the Vern Tardell Slingshot 2×2. 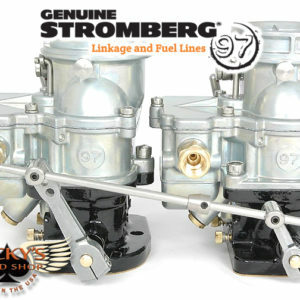 It can also be used for early Ford 4-banger (Model A/B engines) 2×2 intakes, which place the carburetors 5 inches part. See above for typical manifold applications. 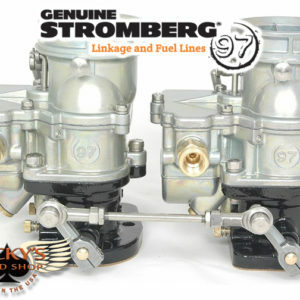 Designed and manufactured exclusively by Stromberg Carburetor, the TwoStep linkage range combines clean, traditional looks with maximum leverage. Each kit comes pre-assembled and installs in just two simple steps, without the need for extended throttle shafts. These kits are not a ‘one size fits all’ solution. Different intakes use different carb spacing, so we modeled every kit in 3D CAD and offer different kits for specific intakes. If you’re in doubt, simply measure your manifold spacing – throttle shaft to throttle shaft. 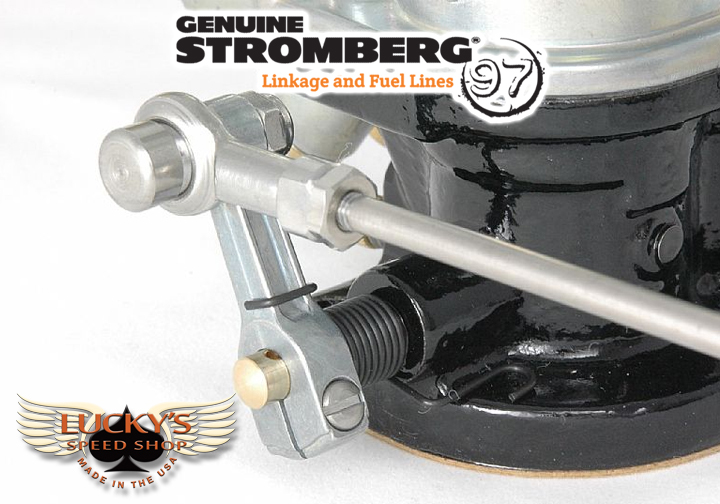 Premium kits have opposite threaded rod ends for easy adjustment. Just spin the rod to adjust for the correct lever angles. Extended throttle shafts are not required. Long die-cast zinc SuperLink lever arms. All other parts stainless steel – even the rod ends and lock nuts. 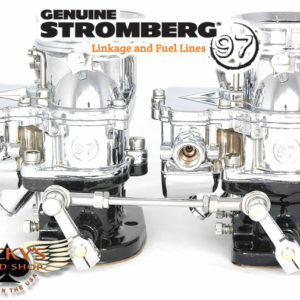 Every kit comes with two new Stromberg ‘Snapback’ throttle return springs, which wrap around the end of the throttle shaft. 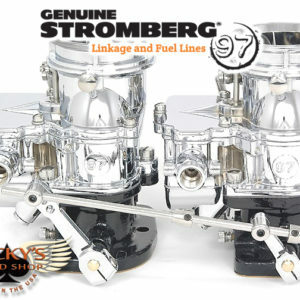 These chemically blacked, stainless steel torsion springs snap the carburetors shut, yet virtually disappear from view. Special swivels and bolts were developed to clamp the rod ends tight. The rounded bolts have a small blind hole in the head. Simply insert a small rod eg, a hex key, to stop the swivels turning while you tighten the lock nuts.